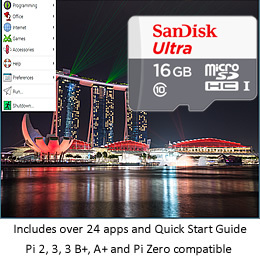 Raspberry Pi 4 for 2019? We eagerly await the next new board release - the Raspberry Pi 4! Pi Day (3.14) seemed a natural, but it did not happen. Will we see it anytime in 2019? RPi Scratch 3 is Out! The popular visual programming language Scratch just got a new major upgrade. We'll post more when it is ready to install on Raspbian. From Menlo Atherton High School, Anna Quinlan won the 18th Congressional District App Challenge for her Smarter Insulin Pump, using a Raspberry Pi! The international Pi Wars challenge will be held in Cambrige, UK on March 30 - 31, 2019. Build and compete Raspberry Pi controlled robots. A new digital festival organized by the Raspberry Pi Foundation and held in Cambridge, UK. Community, projects, technology, idea sharing, . . .
Fittingly on "Pi Day" 3-14, the Raspberry Pi Foundation announced immediate release of its new Pi model 3 B+ with improved performance. A 750 node Raspberry Pi cluster, with 3,000 total CPU cores, was created by BitScope Designs. 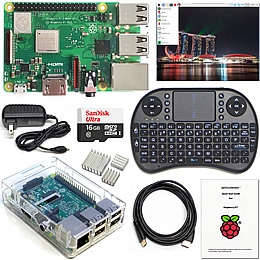 A treasure trove of information - news, projects, programming, tutorials, features - all about the Raspberry Pi. The February 2018 issue is now available. The Raspberry Pi Zero is the mini cousin to the Raspberry Pi 3. The WH version includes presoldered GPIO pins.